KURT's new D688 vices, available through DoAll Australia , set the industry standard for precision clamping with the highest clamping force for any given input torque. With a jaw opening of 8.8 inches and repeatability to within 0.001 inch, these vices produce up to 7,968 lbs clamping force with just 80 ft lbs input torque. 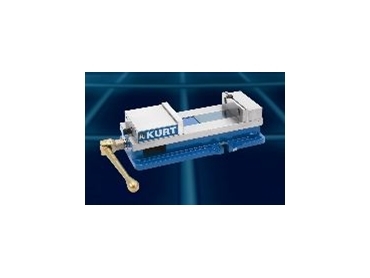 According to Kurt workholding engineers, this is up to 36 percent greater clamping torque than equivalent competitor vices. This high clamping force/low input torque advantage holds true through the D688's entire clamping force range. Designed with high precision roller bearings and a hardened vice screw mechanism, D688 vices distribute clamping force evenly and precisely across the full jaw surface. The Anglock spherical segment in the moveable jaw further reduces jaw lift. Adding to overall vice rigidity while absorbing machining vibration, Kurt D688 vices have porosity-free, 80,000psi ductile iron bodies. Thick, baked epoxy finish protects vice body from corrosion. Additional features include removable, hard-ended jaw plates, ergonomically designed vise handle and GrooveLock workstops that store easily in the vice body. Designed for use on all types of machine tools including machining centres, knee-type mills and grinders, D688 vices are suitable for all types of machining operations. These include precision boring, tapping, drilling, grinding and finishing with high accuracy on most part configurations.